January 30, 2012… The Stratford Shakespeare Festival and Melbar Entertainment Group are pleased to announce the cinematic release of Twelfth Night, directed for the stage by Des McAnuff, and produced and directed for film by Barry Avrich. This joyous play, filled with music and song, will première in select Cineplex Entertainment theatres across Canada on March 10 at 12:45 p.m. local time with an encore performance on March 21 at 7 p.m.
Tickets are on sale now and can be purchased at participating theatre box offices and online at www.cineplex.com/events or through the Cineplex mobile site m.cineplex.com. The production features Stephen Ouimette as Sir Andrew Aguecheek, Brian Dennehy as Sir Toby Belch, Ben Carlson as Feste, Trent Pardy as Sebastian, Cara Ricketts as Maria, Tom Rooney as Malvolio, Andrea Runge as Viola, Mike Shara as Orsino, and Sara Topham as Olivia. Mr. McAnuff’s production of Twelfth Night thrilled Festival audiences during the 2011 season and was one of the most successful Shakespeare productions of his tenure so far as Artistic Director of the Stratford Shakespeare Festival. It features an eclectic score reflecting the history of rock and roll, composed by Michael Roth and Mr. McAnuff. Twelfth Night is the story of Viola, a young woman shipwrecked on the coast of Illyria, who adopts a male disguise to enter the service of Duke Orsino, only to find herself part of a triangle of unrequited love. Meanwhile in the household of Orsino’s love interest, the Countess Olivia, Sir Toby Belch and his unruly companions trick Olivia’s strict and disapproving steward, Malvolio, into believing that she loves him. Production sponsors include the Slaight Family Foundation, Ontario Tourism Marketing Partnership, Violet Productions and Richard Rooney. Support for the original stage production was provided by Scotiabank Group, Dr. M.L. Myers and Dr. W.P. Hayman. The music of Twelfth Night has been released on CD and is also available for download on CD Baby. The CD, along with DVDs of The Tempest and Caesar and Cleopatra, are available to purchase through the Festival’s website: stratfordshakespearefestival.com. 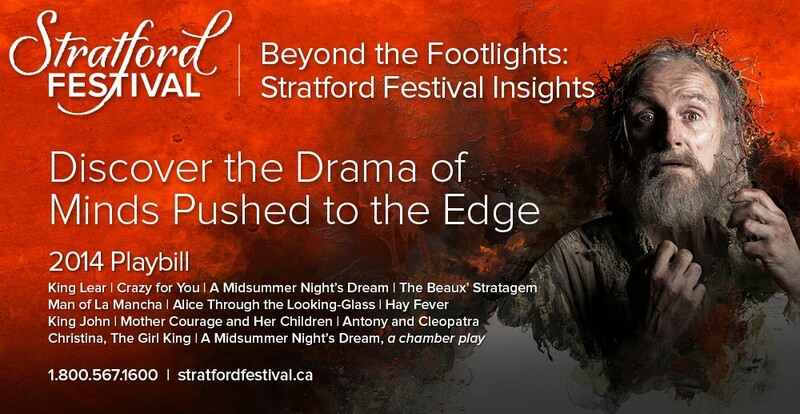 This year, the Stratford Shakespeare Festival celebrates its 60th season, with 14 productions presented from April 12 to October 28: Much Ado About Nothing; 42nd Street; The Matchmaker; Henry V; You’re a Good Man, Charlie Brown; The Pirates of Penzance; A Word or Two; Cymbeline; Wanderlust; Elektra; MacHomer; The Best Brothers; Hirsch; and The War of 1812. .
Rene M. Caisse, 100 Clearbrook Trl. This entry was posted in Uncategorized and tagged Andrea Runge, Antoni Cimolino, Barry Avrich, Ben Carlson, Brian Dennehy, Cara Ricketts, Des McAnuff, Michael Roth, Mike shara, Pat Marshall, Sara Topham, Stephen Ouimette, Stratford Festival, Stratford Shakespeare Festival, Tom Rooney, Trent Pardy, Twelfth Night by Stratford Festival. Bookmark the permalink.